A further 37% of respondents also said that they would consider paying for a loyalty program app, depending on the benefits. Many UK retailers have already begun the move over to app-based loyalty schemes, with Starbucks, Game and B&Q being prominent examples. Obviously this doesn’t mean that retailers should be rushing to abandon their existing loyalty schemes though, as a majority (57%) of respondents stated that they still want a traditional card. The Share The Love research, published by The Loyalty Point, is based on a survey of 1,000 Australian loyalty program members. Data privacy is a common concern among consumers when signing up to loyalty schemes, as people expect to receive a barrage of spammy letter and emails from ‘trusted partners’ that have somehow gained access to their personal data. The research shows that just more than half (52%) of consumers would not give permission for their data to be shared with a third-party organisation in order to gain access to more benefits, discounts or offers. 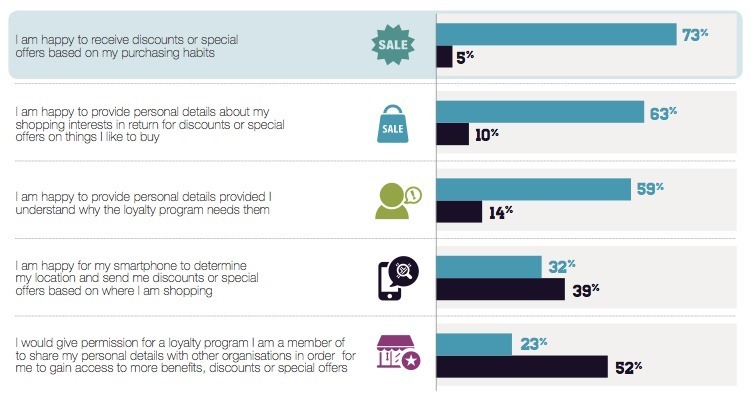 However almost three-quarters (73%) of people are happy for their purchasing history to be tracked if it results in relevant offers or discounts from their existing loyalty scheme. People were split on the use of location data though. When asked if they would be happy for retailers to send targeted offers based on their smartphone’s location data, 32% were in favour but 39% were against the idea. To download the full (paid) report, click here.